CHICAGO — The risk of going home to Chicago is heartfelt. It’s my birthplace, where I was raised and schooled by Mr. and Mrs. Robert Fitzgerald. I mentioned in one of my radio broadcast reports that I had put my bulletproof vest on as I arrived at O’Hare International Airport in Chicago. I take pride in my accuracy — I learned Monday that there were 20 shootings in Chicago over the weekend and three people killed. They may have painted the Chicago River green celebrating St. Patrick’s Day Sunday, but the bloodshed continues in a city once ruled by Al Capone. Even in fear of tragedy, there is no place like home. I was in Chicago at the United Center on the west side of town for the Men’s Big Ten Basketball Tournament Wednesday, March 13 through Sunday, watching the deepest college basketball tournament with 14 teams play their hearts out before 122,000 fans. It started 20 years ago; if it’s not the best post-season tournament, it can only trail the Atlantic Coast Conference (ACC). So let the journey begin: It’s called March Madness. The men’s field of 68 teams begins this week with the challenge of who can win six games and capture a national championship. It won’t be easy getting to Minneapolis for a shot at that one shining moment. The Minnesota Gophers qualified for the NCAA tournament by winning twice over Penn State in overtime and Co-Big Ten champion Purdue. Senior Jordan Murphy and Junior Amir Coffey did the heavy lifting. 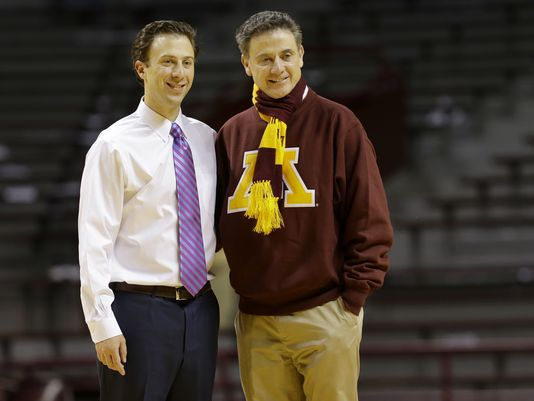 The men of Richard Pitino earned him his second NCAA bid, and they are seeded number 10 in the Midwest Region. They play Thursday against Louisville in Des Moines, Iowa. Louisville was once coached by Pitino’s dad. He won a national championship there before being fired for accusations of NCAA violations. How strong is the Big Ten? They were denied an NCAA number-one seed despite getting a record-tying eight teams in the NCAA field of 68. Michigan State, the Co-Big Ten regular-season champion and Big Ten Tournament champion with three wins over Michigan, were robbed. Then they were seeded number two in the East Region along with number-one tournament seed Duke. Michigan players, who wore pink signature shoes in Chicago, also received a number-two seed. They started the year 17-0 and beat defending NCAA champ Villanova and number-one Midwest seed North Carolina, who beat Duke twice. Regular-season Co-Big Ten champ Purdue, seeded number three in the NCAAs, lost to the Gophers twice, including 75-73 in the Big Ten Tournament. Wisconsin is seeded number five, Maryland number six, Minnesota and Iowa are 10 seeds, and Ohio State is seeded 11th. Let’s hope the Big Ten teams do better than they did the last time they had eight teams in the NCAA tournament. That year, 2016, not one BIG team reached the Elite Eight. The mighty ACC with Duke, North Carolina, Virginia — all number-one NCAA Tournament seeds — got seven teams in, as did the SEC Conference, receiving NCAA bids. Syracuse is one of those ACC teams coached by Jim Boehiem, who killed a 51-year-old man recently in a car accident. No charges were filed. Boehiem is coaching his 34th NCAA team in the tournament. Auburn won the SEC Tournament championship. Kentucky and Tennessee are also highly regarded. Charles Barkley, Samuel Jackson, and Oscar-winner Spike Lee are featured again in NCAA Capital One commercials. Larry Bird is featured also on the road to Minneapolis and the Final Four. Did you know that Bird and I were both at Indiana State at the same time? In fact, I was the most famous Larry at ISU until he arrived and led us to the Final Four. This time of year in March, the NCAA has the best of both basketball worlds, national focus on the NCAA Tournament and the NBA as well with Duke star Zion Williamson easily the prohibited next NBA number-one pick. He’s the most explosive, electrifying talent since Michael Jordan, Magic Johnson and Larry Bird. He’s also being compared to LeBron James and his enormous NBA potential. With millions of Americans having tournament brackets and work pools, billions of dollars will be wagered on this tournament, while the players — all amateur student athletes — will get…what? Great memories, the experience of a lifetime, and just maybe a parting gift like a CD player or earphones. Yes the NCAA has a monopoly — that is no secret. They rake in many billions of dollars, and their partners and sponsors and bookmakers share in the enormous profits. I ask the same question each year: What about the players? Where is their piece of the pie, NCAA?